Two weeks ago we finally started seeing some scortch mites in our pecans. Normally they start up in August, and we are treating them in orchards along with black aphids. Almost all of August went by and I realized I didn’t know of anyone who treated for mites. I talked with UGA Extension Entomologist Dr. Will Hudson and it has been mostly the same with the rest of the state. Does it mean we’re in the clear? No necessarily. Once we get to mid-August, our crop goes from the nut sizing period to the kernel filling stage. This stage is more important in terms of water and stress. August is generally noted as the most critical month for pecans since the tree is physiiolocially setting its female flower. Any stress (lack of rain, insects, disease) can affect next season. Scorch mites and young on underside of pecan leaves. Arrows pointing toward eggs. 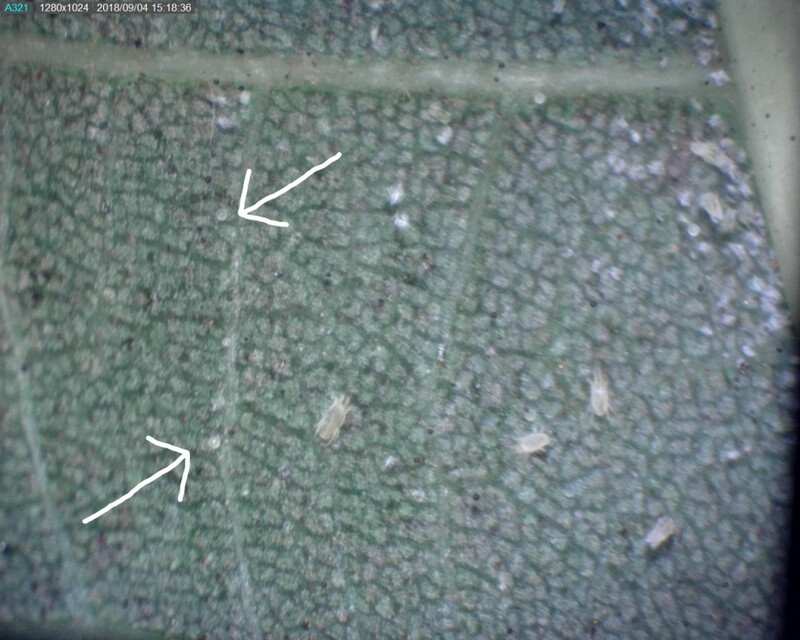 Generally we overlook mite damage, so we’ve been looking at lots of leaves under the microscope. The technical threshold is when we have 100+ under 1 or 2 leaflets in a compound. Truthfully, we can pull the trigger on treating when numbers are increasing and leaf health declines. I’m seeing as much as 75 under the leaflets here, and lots of eggs and babies and webs. They tend to start on the low limbs, in the shaded interior portion of the tree. They then spread up and out from there.